Sebastian Vettel certainly got the better of Nico Rosberg in the post-race press conference in Melbourne as he teased the Merc driver over some of his comments. Mercedes dominated the season-opening Australian Grand Prix on Sunday with Lewis Hamilton beating team-mate Rosberg by 1.3s to take the victory while Vettel was 34s behind in third place. Formula 1 fans are no doubt hoping that the rest of the pack can catch up to make it a closer contest at the front and Rosberg also admitted after the race that he wants Ferrari to be up there. "I hope we can have a good fight. That would be awesome. I think the next couple of races we’re going to be leading the way for sure, and we’re going to try and keep it that way, but we know it would be good if they can come a bit closer, as long as they don’t come too close…" the German said. The comments raised an eyebrow from Vettel and he interjected: "Be honest. Do you really hope so? Seriously? You finished 30 seconds ahead of us and you hope it’s going to be closer? So you hope you slow down? Is that what you’re saying?" Rosberg's replied that it is "important for the sport and for the fans" that the battle up front is closer, but Vettel wasn't going to let it die. "First suggestion, if you don’t mind, I think your garage becomes public for Malaysia and everyone can have a look. No? I’m joking," he said. 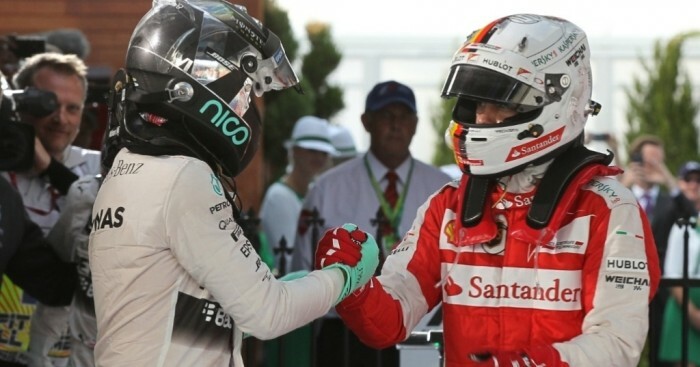 Rosberg: "You can come if you want, we can invite you…"
Vettel: "OK, thank you for the invite, I’ll come." Vettel: "Engineers’ room? Debrief, I’ll be there." The teasing didn't quite end there as Rosberg later suggested that Vettel wasn't too unhappy to see Kimi Raikkonen retire on lap 40, asking: "You find it a shame that your teammate didn’t finish…"
Vettel once again got the better of his compatriot, saying: "Yes. I don’t know how much you like each other but Kimi and myself we get along, so I think it is a shame."